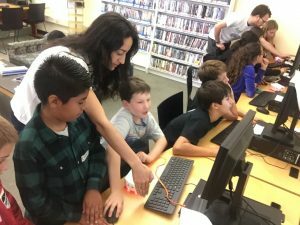 TechyKids held a community workshop at the Belle Haven that was free to participants! Kids of ages 7-11 had the opportunity to learn about robotics, technology and coding, getting hands on experience. The workshop was full with 11 signed up kids, with 5 boys and 6 girls participating. Kids enjoyed hours of learning, coding and building. It is important to note that the Thymio robot is available to available borrow from the Menlo Park library system for continued learning for the community. The library even needed to create a new category of “Robots” to the catalogue to be checked out!